January 16, 2008 – New York, NY – Hennessee Group LLC, an adviser to hedge fund investors, estimates that hedge fund industry assets increased by $462 billion in 2007 to $1.997 trillion. The increase in assets represents +30% growth over industry assets since the beginning of 2007. Preliminary results indicate that the hedge fund industry experienced net inflows of $278 billion (+18%) in 2007. The remaining $184 billion (+12%) was the result of positive performance, as evidenced by the Hennessee Hedge Fund Index, which advanced +11.6% in 2007. 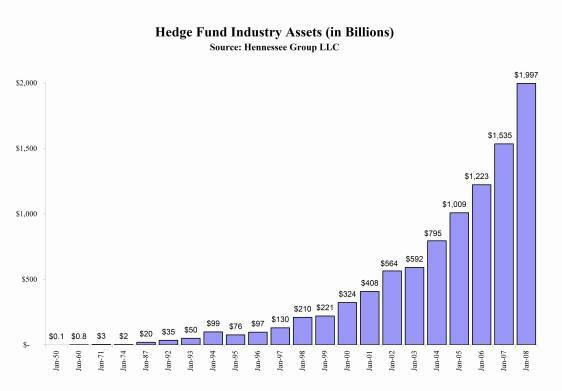 These figures do not include assets invested in fund of hedge funds. The amount of inflows ($278 billion) represents the largest amount of annual inflows into the industry in its history and a 75% increase over the amount of inflows in 2006 of $159 million. The percentage increase in assets due to inflows (+18.1%) represents the highest level of inflows since 2001. Total assets for arbitrage and event driven funds were up approximately +35% in 2007. The Hennessee Arbitrage/Event Driven Index advanced +7.8% for the year, as arbitrage strategies were affected by the volatility in the credit markets. The majority of assets flowed to large, multi-strategy funds, as they have been the preferred choice among pensions as they make direct investments in hedge funds. Total assets for long/short equity funds increased approximately +26% in 2007. The Hennessee Long/Short Equity Index advanced +12.1% in 2007. After experiencing slight outflows from the strategy in 2006, investors became more interested in the strategy in 2007, as returns improved relative to equity indices due to a better environment for short selling. Going into 2008, Hennessee Group estimates that individuals/family offices and fund of hedge funds represent the largest sources of capital for hedge funds, each comprising 31% of total industry capital. Pensions represent another 14% of industry capital, while endowments/foundations represent 12% and corporations represent 12%.